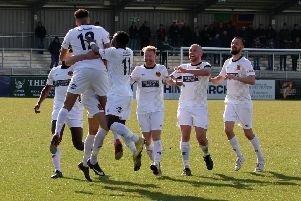 The Reds had looked like surviving the late onslaught that National League North high-flyers Chorley had thrown at them, but were unable to prevent the hosts from equalising three minutes from time then snatching the winner deep into added time. Liam Hearn marked his return to the starting line-up with a vintage strike that polished off a slick Alfreton move, slotting the ball low past home keeper Ritchie Branagan from 12 yards after Paul Marshall had combined with skipper Andy Monkhouse to create the chance. A blustery wind and a heavy pitch that had survived a morning inspection made playing conditions difficult, yet Alfreton had shown early promise with Branagan having to beat away Tom Allan’s driven cross and Niall Heaton powering a header inches wide from a Marshall free-kick. Keeper Fabian Spiess though had been called into action to thwart Dale Whitham as early as the sixth minute, saving confidently low to his right, but Chorley were otherwise restricted in the opening 45 minutes to a Kieran Charnock header that flew wide from a right-wing corner. Matt Challoner’s swift break four minutes into the second half led to Jack Sampson being denied by a brilliant Spiess save, then Ryan Wilson had to clear off the line from Paul Jarvis before the Reds rallied with Allan’s header going close from a Marshall corner. Both Whitham and Marcus Carver went perilously close as Chorley cranked up the pressure, then with 12 minutes remaining Alfreton were unable to capitalise on an opening initiated by Hearn before Mark Shelton’s intended cross for Sam Smith was blocked. Alfreton could still sense a chance of restoring the lead, but Marshall’s angled drive was held by Branagan and Hearn just failed to reach Paul Clayton in front of goal as the clock ticked into the third minute of added time. Sixty seconds later the nightmare scenario unfolded with Jarvis again whipping in a cross from the left that was headed in at the back post by Josh O’Keefe. The Reds deserved better, but in a twist of irony conceded two late goals just as they had done themselves earlier in the season at the lmpact Arena to salvage a draw. CHORLEY: Branagan; Challoner, Jarvis, Teague, Charnock [O’Keefe 80], S.Jordan, Blakeman, Whitham [Roscoe 68], Carver [McDaid h/t], Sampson, Cottrell. Subs not used: Beesley, Roscoe. ALFRETON: Spiess; Richards, McGowan, Heaton, Wilson, Monkhouse, Marshall, Shelton, Allan, Hearn, S.Smith [Clayton 90 + 2]. Subs not used: T.Jordan, A.Smith, Gascoigne.